Welcome to OOAL CSA delivery #3! We're glad you've made it this far! An old physics professor of mine would always say that if a student of hers could survive the first month rigorous coursework, they would surely make it to the end of the semester with a decent grade. In the same way, we know you'll make it the rest of the way! While we're certainly not going to grade you, we do feel obligated to teach you a thing or two about apples. How about some Apple Physiology 301 for this week? What's up with the glassy splotches in the flesh of some apples? It is a condition called "watercore." It can arise in apples that have ripened fully on the tree, and it is a result of sap getting delivered from the fruit to the tree but leaking into the intercellular spaces of the apple flesh because the fruit cells are unable to absorb the sap fast enough. Apple fruit has a large amount of intercellular air space, (20-35% of total tissue volume), but watercore fills pockets of the air space with liquid. This liquid reduces the light scattering ability of the tissue, causing it to appear more translucent than normal. Is it a sweet treat, or a disorder? It is both. Since watercore can develop only on the tree to fully ripe fruit, it is an indicator that the apple has reached peak flavor, and the watercore makes it even sweeter. That being said, apples with watercore won't keep as long, so be sure to enjoy them soon. Why do some apples have it and others don't? Believe it or not, there is no academic consensus on what triggers watercore. There are more than a dozen factors that likely contribute to watercore (e.g. temperature extremes, mineral content of the soil, leaf to fruit ratio on the tree, etc), but the exact trigger or set of triggers hasn't been agreed upon. A common agricultural "disorder" that science hasn't figured out yet?? If that's not jaw-dropping enough for you, how about this: slight watercore sometimes disappears in cold storage. That's right, folks, the water-soaked tissue returns to normal looking tissue. Apples never cease to amaze, do they? While there is a seasonality to farming that from a distance makes it appear routine and at times mundane, when you have your feet on the ground (and your head in the trees) you realize the extraordinary variation that occurs not only day to day but week to week and year to year. Case in point, four of the six apples in your share this week were included in Week #4 last year, and one of those was part of the Week #2 share in 2016. This fall they have ripened two weeks earlier or later than whatever schedule we assumed they were on. Clearly the apple trees have a mind and rhythm of their own. It keeps us guessing and tasting a lot of apples for ripeness. So this week we have two apples that should be enjoyed fresh, two that beg to be turned into something savory or sweet and spicy, and two that can roll either way. If you need to eat an apple on the way home from picking up your share, dive into a Sweet Sixteen. Take a moment to explore the flavors that assault your palate from start to finish. What do you think it tastes like? Vanilla, bourbon, cherry lifesavers, anise? We have given you a lot of them so you can change your mind as you eat your way through the bag. And if you can’t finish them all in two weeks, you can store them in a cool place for a month or two. In contrast, your bag of Opalescents is small. Not many of these greasy, lipstick-red apples around this year. So if you are a fan of Opalescent, be prepared to eat these fast before the rest of your family and friends get their hands on them. If the cooler fall temperatures are making you long for the comforting smell of cinnamon in your kitchen, pull out the bags of Nodhead and Blue Pearmain. Normally we like Nodhead for fresh eating, but we are a bit disappointed in the flavor this year. So we recommend adding value by turning them into a culinary treat. Some think Nodhead is the offspring of one of our favorite baking apples, the fantastic-looking, Blue Pearmain. We say it every year, but we will understand if you choose to display these around your house instead of eat them – they are that beautiful. However if your stomach prevails, then you won’t find a better apple for baked apples than Blue Pearmain. The last two varieties in your bag are the eating-fluid apples, Twenty Ounce and King of Tompkins County. The former is most often recommended as a cooking apple, mostly because it is so big that it challenges even the widest mouth, but the flavor this fall seems to have the perfect balance of tart and sweet to make it enjoyable for fresh eating. Try slicing it up and sharing it with a friend or pairing it with cheese after dinner or in a sandwich. King, as it is often called, is sweeter than Twenty Ounce and not quite as daunting in size. Try using it fresh in a salad. Makes good sauce and cider too. 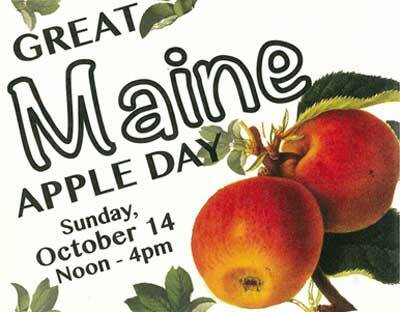 October 14; Great Maine Apple Day, talks and tastings: MOFGA Education Center, Unity, ME. See MOFGA website for details. October 19; 7 PM: “Kavanagh is also an apple!” Nobleboro Historical Society at the NHS Center in the schoolhouse, 98 Center Street, Nobleboro, ME. October 21; 2 PM Finn Center, Maple St. West Paris, ME. Be sure to check our events page for a talk near you! Every Christmas morning we make a dish called Finnish Oven Cake for breakfast. Basically it is a giant popover that when sliced up and served is the perfect conveyance for syrup and jam. We always hope that it will arrive at the table puffed up and golden – a spectacular display of our early morning culinary skills. But every once in a while, the Finnish Oven Cake is a dud – it doesn’t rise up at all. Instead it comes out of the oven looking slumped and solid. If only I had had this recipe years ago, I could have salvaged those disastrous mornings by covering up the unhappy “pop-under” with mapley apples, since that is what the Apple Puff Pancake is all about. You whir up the batter in the blender – so easy – no need to separate eggs or whip the whites – pour it in a hot, oven-proof pan with melted butter – and stick it in to bake. When it comes out, there is no tiptoeing around. You can have a dance party right there in your kitchen, since you want that pancake to collapse. Amazingly, only the center sinks down while a 1” lip remains around the edge. It looks like a golden-brown swimming pool that you get to fill with buttery, sweet sauteed apples or other fruit. Christmas morning will never be the same. Preheat oven to 425 degrees. Place the butter in a 10” ovenproof skillet, and stick it in the oven till the butter melts – about 3 minutes. Don’t let it burn. Remove from the oven, and tilt the pan so the butter coats the bottom and the sides. Place the eggs, flour, sugar and nutmeg in a blender, cover and process until it is smooth and all the lumps are gone. Pour the batter into the hot skillet. Bake in the oven until puffed and brown, 17-20 minutes. While the pancake is baking, heat the remaining butter in a 12” or larger skillet over medium heat. You need a larger skillet so there is enough room for all the fruit to cook evenly. Add the apples and maple syrup, and sauté until the fruit is tender, about 12-15 minutes. Remove the pancake from the oven, jump up and down until it slumps in the center, and fill the basin up with the warm fruit. Serve immediately – although it is pretty darn good cold the next day. *The recipe that our daughter sent me called for 3 medium apples and 3 medium pears. I didn’t have any pears handy so I used 3 large Twenty Oz. apples and 2 cups of frozen raspberries that I tossed into the apples for the last minute or two so they would thaw but not overcook. It was a great combo though I suspect that whatever fruit you have available will work just fine. With Twenty Ounce again in season, I have been dreaming about these fantastic Bloomin’ Apples and mentioned so to Jen. She immediately thought instead of the famous Bloomin’ Onion - the restaurant appetizer - and eagerly began thinking of ways to do up a savory version with apples. Here is one such take on the sweet recipe we featured in 2015. Please note: It’s tricky to slice the apples correctly, If sliced too shallow, it does not open up and cook uniformly, but cut too deep and it falls apart and turns into kind of a mess. If done right, well, it’s… still kind of messy, but quite delicious any way you slice it. This recipe is a very loose guide. Get creative with toppings and let us know what else you discover! Slice off the top ¼ of the apples. Scoop out the core. Use a thin knife to make two, deep circular cuts around the center of the apple. Next, turn the apple over and make narrow cuts all the way around the apple. Flip it back over and you can see all of the cuts. With the apples cut side up, pat the garlic onto the tops of the apples and drizzle with olive oil. Add a tiny pinch of salt per apple and sprinkle breadcrumbs generously. Bake for 45 minutes, but check periodically. I sprinkled on the parmesan cheese halfway through the baking time. Experiment! Try smoked paprika or an onion, sausage, cheddar and sage topping combo. If you have any comments, questions, or suggestions, drop us a line at csa.outonalimb@gmail.com.